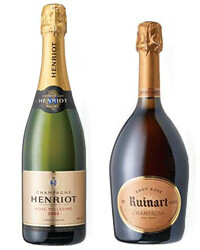 We've singled out our favorite sparkling wines for any occasion. From flavor notes to pairing ideas, we've got you covered. This fruity cava, a blend of the Spanish grape varieties Garnacha and Monastrell, isn’t wildly complex, but it’s remarkably affordable and delicious. Collalbrigo, in Italy’s Veneto, has become a top Prosecco producer since its founding in the 1960s. This spicy, eminently drinkable wine shows why. The Llopart family has been growing grapes in Spain’s Penedès region since the 1300s, but its wines have only recently appeared in the U.S. This deep-pink blend of Monastrell and Pinot Noir is saturated with rich berry notes. Canella, which is primarily known for its very good (and very popular) Prosecco, also makes this pale orange, lightly citrusy rosé spumante (an Italian term for sparkling wine). It’s produced entirely from Pinot Noir, or Pinot Nero, as it’s known in northern Italy. Australians have long known that Tasmania produces arguably the best sparkling wines in the southern hemisphere. Jansz’s Pinot Noir–dominated rosé from the Tamar Valley is ripe and rich, with a floral scent and deep berry flavors. Made entirely from Pinot Noir, pale salmon-pink in color and full of perky apple and berry notes, this rosé sparkling wine from France's Alsace region—and from a winery whose history dates back more than 500 years—is cheerful and lively. This off-dry (i.e., lightly sweet) sparkling wine with a vibrant ruby color comes from Italy’s Piedmont region. With its penetrating floral fragrance and sweet, vivacious raspberry flavors, it is a great aperitif for almost any occasion and is good with dessert, too, since it pairs well with chocolate. An off-dry rosé sparkling wine from Bugey, one of the smallest and least well-known wine regions in France, this delicate, lightly alcoholic (7.5 percent), berry-flavored wine is made from the Gamay and Poulsard grape varieties. Bollinger, one of the most famous Champagne houses, now owns this well-regarded Loire estate. It produces a classic Crémant rosé composed entirely from Cabernet Franc: light and delicate, with vivid flavors of wild berries and fennel. 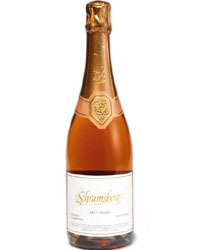 As far back as 1880, Schramsberg was making wine in Napa Valley, though it wasn’t until 1951 that the estate began producing sparkling wines. Ever since then, it has been one of America’s most reliable producers, making wines like this pale orangey-pink rosé, with its gently spicy raspberry fruit and firm, zesty acidity. Famed Champagne producer Louis Roederer’s estate in northern California’s cool and windy Anderson Valley puts out one of America’s top brut nonvintage sparkling wines (it won F&W’s 2005 American Wine Award for best sparkling wine). It’s also known for this pretty, brioche-and-wild-strawberry-scented rosé. Most people don’t associate Austria with sparkling wine, but this one is well worth noting. Szigeti’s elegant pale-orange rosé, a blend of two little-known (in the U.S., at least) Austrian grape varieties, Blaufränkisch and Zweigelt, has the richness and flavor of freshly baked strawberry shortcake, yet also manages to be entirely dry. Bright, zesty and full of citrus flavors, this Virginian rosé sparkling wine comes from Chardonnay and Pinot Noir grapes grown on the edge of the Blue Ridge Mountains. Laurent Champs, owner and winemaker of the top-quality Champagne producer Vilmart et Cie, consults on the making of this impressive wine, and his expertise shows. Napa Valley’s Domaine Carneros, owned by the illustrious French Champagne house Taittinger, produces some of California’s best sparkling wines, among them this salmon-colored rosé. It balances lemony acidity with lush strawberry fruit. Looking for more bubbly? Check out our guide to champagne.